The legend of Dangerous Dave is an interesting one that began back in 1988 on the Apple II. Nine versions of Dave later and still no decent sequel to Dave II in sight! This is an issue of PC Games magazine from Sept/Oct 1990 that Scott Miller (then of Apogee Software) sent me with some post-it notes pointing out some recent mentions of his Kroz games and an author that he was starting to publish. Also in this issue was the ad for the sampler disk of games that kicked off the Gamer's Edge subscription product. When this ad was made we didn't have a name for the product so they called it "SuperGame Sampler" - lame. A while later we called it PCRcade....until Softdisk found out someone else trademarked the name. Then we finally settled on Gamer's Edge for the product. 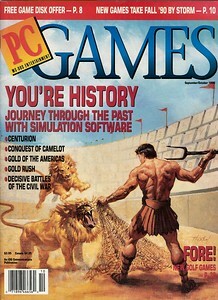 Some time after Softdisk ceased publishing, Computer Gaming World started using the name for one of their columns. This is the ad for our Gamer's Edge first issue where we put two games on a sampler disk to show potential subscribers what they would be getting. 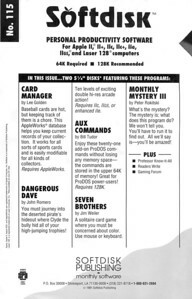 John Carmack's game CATACOMB and my game DANGEROUS DAVE were both on the disks (there were two 3.5" disks). I also wrote the menu shell program that you used to choose the game or read articles. The artwork for Catacomb was alright but the Dangerous Dave cover looked like someone's baby drew it after waking from a nightmare. My favorite part of the ad is the sentence "Every two months we will send you new, never-before-published games written by the world's best game designers" - that's Softdisk marketing at its finest. This is the ProDOS disk directory of files for Dangerous Dave (Apple II). Ignore the FINDER.DATA file, please. Please. Here's the cover page of Softdisk 115 where Double Dangerous Dave was published. This art was created by Kevin Cloud (of id Software). Yes, Kevin worked at Softdisk, too! Thanks for renaming my game, Tom! It was originally "Double Dangerous Dave" but I think Tom wanted to add his own little bit of alliteration to the title instead of letting me reach the next amazing level of game-naming with a TRIPLE alliteration! The fucker. Oh, hi Tom! I love you! The double-res version of the legendary PC version's title screen. Now ITS OWN legend of legends in legend-land. Here's the first level - you can see how I followed the design of the PC version. Kinda funny that the double-res Apple II version isn't a port of the Apple II original version but a port of the PC version. That was the basis of our contest - port the PC version of the game, not the Apple II version. 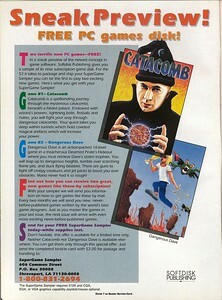 So now you know that Catacombs was an Apple II, Apple II double-res and a PC game as well! Second level and you can see that I changed the graphics of some of the items from the PC version. Here's the end of level two and you can see that I changed the "PCR" letters (which stood for PCRcade) to "ID". John C. and I were officially at id when we did our double-res games then sold them to Softdisk. Nice little high score screen. Oh, look, I got two high scores! The Apple II UpTime version of Dangerous Dave, the ORIGINAL version, was published with an article you read in the UpTime shell. And here it is - beware, it's long. The text was written by my friend Jay Wilbur, the Editor of UpTime back then, and future id Software CEO.